This is part of a series of articles exploring some of the terms and tools used in e-learning (view other articles in the series). We’ll do our best to break down the jargon and explain what things are from a basic perspective. 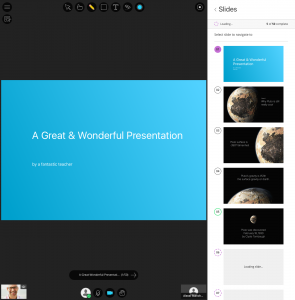 Blackboard Collaborate is a ‘Webinar’ tool that allows live presentations to be made to an audience over the internet. Webinar tools have a few basic features in common, such as the ability to display PowerPoint slides while narrating and to share the host’s desktop for demonstrating software or websites, but as a tool developed for education, Collaborate has some additional, optional features that can be beneficial in a teaching situation. These include simple voting tools, virtual breakout spaces, the ability for participants to ‘raise a hand’ to ask a question, and, most usefully and importantly, a text chat area to interact with each other and the presenters. Collaborate is a useful tool to support a range of different teaching requirements, including enabling students who can’t physically attend a session to take part remotely, bringing external presenters into a face-to-face session to be questioned by students, encouraging students to explore a web resource by sending them to it simultaneously and then forcing them to return to the presentation. It supports the use of webcams, which can either be focused on the presenter or used to show a physical object, but, most usefully, it allows the main presenter to let other people to use their microphone to speak to the rest of the participants making is a very good tool for question-and-answer sessions. Participants can use a PC or laptop to access all of the features of the session, while smartphones and tablets can use either a more streamlined version in the web browser or a dedicated mobile app. Each module in Blackboard has a dedicated Virtual Room in Collaborate that can be used to run the sessions. With Collaborate you can easily record the session and it is then listed privately in the Blackboard module, from where you can make the recording available to students. To access the Collaborate room for your module, and any prior recordings, use the ‘Blackboard Collaborate’ link under ‘Module Tools’ on the left menu of your module. October 17, 2016 in Article, Blackboard, Blackboard Collaborate, Resource. Tags: Blackboard Collaborate, Interaction, Media, Mobile, Technology, What_is_a?